Eager Family Blog: Did You Know Chickens Get Married? Did You Know Chickens Get Married? Yesterday a friend was over, and she was looking at photos Rachel has taken. She is a graphic artist and photographer and teaches photography to some of the kids in our homeschool group. Rachel doesn't take the class because she helps watch Diane's kids while she teaches, so Diane has kindly agreed to teach her some things on the side. 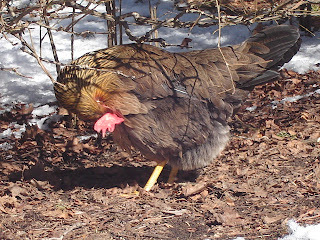 Rachel showed her a photo she'd taken of one of the chickens, a closeup where you could see all the colors and patterns on the hen's feathers. Diane asked if the chicken was a rooster or a hen. Before Rachel could say anything, Ben stepped in. "We don't have any roosters," he informed her. "They're all girls. Mama doesn't want the chickens to get married." So Diane, being a mom and a good sport in general, played along. "Oh--you mean chickens get married? Do they wear chicken dresses?" I joined in and mentioned that they could have chicken flower girls and do the chicken dance at the reception...but Ben was not deterred by our silliness. "When a rooster and a hen get married, they would have baby chicks, and Mama doesn't want any more chickens. Also, they crow too much!" That is TOO funny! The kids just asked my if we could incubate again. When I said no I blamed it on you, saying you didn't have room for any more chickens!!!!! Surely Tobeigh can't be the reason? !